This is the eighth in my occasional series of “Books on the Horizon” – travelogues I dream of researching and writing, though probably never will. 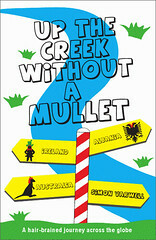 My “Books on the Horizon” are an exercise in creativity, idle whimsy and – through any reactions I get – testing the water. Read more about the series in this introductory page, and see the idea that inspired it – The Impossible Books of Keith Kahn-Harris. 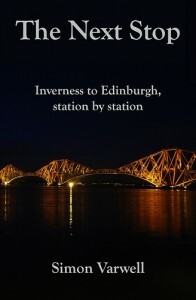 A book about a series of journeys close to home that are an enticing combination of travelling by foot and by train. Some time ago I remember leafing idly through the road atlas that sits in our car, and spotting the potential for a very interesting walk from Inverness to Skye, following either existing footpaths or just routes suggested by the natural lie of the land. Taking the Great Glen Way out of Inverness, then turning off at Drumnadrochit towards Tomich, you’d walk through Glen Affric, past (or over) Beinn Fhada, and emerge somewhere round Shiel Bridge. You’d then walk somehow to Glenelg, get the ferry over to Kylerhea on Skye, walk around the far eastern heel of Skye to the Skye Bridge, then get the train home from Kyle of Lochalsh. Simple as that. It would take four, possibly five, days with obvious and mostly convenient overnight stops along the way. It was only a rough route, and I had no idea if (or how) I could avoid certain stretches of main road, especially Drumnadrochit to Tomich. But I was clearly a bit of a prophet ahead of time, because not long after having this idea the Affric Kintail Way was officially created and launched. That meant that I could walk from Inverness to Skye using footpaths – the Great Glen Way then Affric Kintail Way – and keep off-road nearly the whole time. The idea of walking to Skye, then rewarding myself with one of Britain’s most scenic train journeys home, struck me as immensely appealing adventure. It would be simple, straightforward, require minimal planning, and combine my two favourite modes of transport, walking and the train. I’ve still not done the walk – for all its simplicity, finding five free days in a row has not been a priority lately – and I had never imagined it would manifest itself in much more than a couple of interesting blog posts and some hopefully good photos. However, since then a couple of other rail and foot combinations have emerged in my head as similar possibilities. Together with other routes, they might just make a book. One of the two additional routes came to me when, as mentioned in this blog post, I realised how accessible Ben Alder is from railway stations on two completely different lines. What if, I wondered, I took the train down to Dalwhinnie, walked for two days to Corrour, then got the train back up to Spean Bridge (the closest station to Inverness at the other end of the Great Glen)? From there, I would have a number of options. One: get the bus home, in the unfortunate absence of a Great Glen railway – though that would feel out of character for something that is meant to be just about walking and taking the train. Two: stay on the train to Mallaig, get the ferry to Armadale, and walk to Kyle of Lochalsh to more or less copy my journey home from the Inverness to Skye walk – a repetition it would be good to avoid. Or three: simply walk home via the Great Glen Way, a simple solution but one that would rather detract from the Dalwhinnie to Corrour centrepiece. Depending on which option I took, the whole trip could take between three and seven days. The second additional idea I’ve had combines the Highlands’ two heritage steam railways. I’d take the train to Aviemore, then the steam railway to Broomhill (or ideally, if I leave it a while, Grantown on Spey). I’d then have a twenty-two mile walk over perhaps two days to Dufftown, from where I can take a different steam railway to Keith, and then the normal train home. I’ve not thought up any similar coherent routes since, though perhaps there is some mileage (so to speak) in some of the north of Scotland’s foothpaths that have been built on abandoned train lines, such as the Deeside Way or the line over the spectacular Cullen viaduct. There is also maybe a route involving the Far North and Kyle lines with a walk between, say, Bonar Bridge and Garve. As long as they all stuck to the common theme of being doable from the centre of Inverness via only foot and train, then I’d be open to adding them. What I like about these routes is that they have come to me naturally and organically, simply by staring at maps and wondering what’s possible. I love the idea of thinking “what if…?” about a journey and then just getting on with it. And most excitingly, they’re all local and therefore immensely accessible. I could imagine these being an enjoyable, rewarding series of journeys that could, in the right weather, really show off the north of Scotland at its best: combining a little bit of both natural and railway history along the way. That’s a tough one. Scotland – especially the Highlands – is the canvass for a great many outdoors writers, and I don’t have the skill or experience to approach what they do. My only real selling point here is my interest in railways, coupled with the hopefully fresh perspective of an enthusiastically amateur walker, whose very ordinariness might be a bit more of a reassuring and inspiring narrator for wannabe explorers than a terrifyingly experienced hiking cyborg. 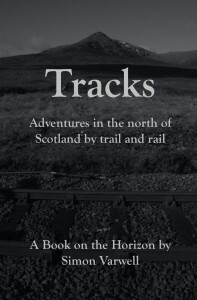 Much as I love this little collection of routes, I can’t help confessing that a book of the journeys would be better delivered by a well-matched partnership of a Highland rail expert and a talented outdoors writer. I am, let’s face it, neither. WHAT WOULD I BE MOST HOPEFUL OF? A sense of adventure and freedom derived from the sheer simplicity of these journeys. There’s nothing more satisfying than doing something fun, with minimal preparation and only what you can carry as your resources. I have long said that the north of Scotland at its best is one of the most beautiful parts of the world, and I would hugely enjoy the mix of the awesome scenery, the exciting challenge, the delight in discovering adventure right on my doorstep, and the satisfying reward of some of the world’s best train journeys to get me home again afterwards. WHAT WOULD I BE MOST FEARFUL OF? My ability to write about this well. I’m not a supremely talented and knowledge outdoors writer who can cast an authoritative eye over the landscapes I’d be writing about, but nor am I a hapless amateur whose inexperience could bring a bit of engaging comedy to proceedings. As I said above, I’m not sure I am the right person for this book at all, though I dearly wish I was. I do worry about having immensely sore legs and shoulders afterwards, too. Oh, and I’d not be best pleased with bad weather. Though frankly I should expect that as standard. WHAT WOULD I NEED TO WRITE THIS BOOK? One of the best things about this concept is its simplicity. So to be honest, I’d need very little. Fitness is the obvious ingredient. I’ve done plenty hillwalking, and would thrive on these routes that easily (if I want) avoid challenging peaks, but I’m out of practice by several months and am seriously unfit. And while I’ve done two or three days of consecutive walking at once in the past, walking for up to a week would be a whole new level for me. HOW LIKELY AM I TO WRITE IT? I don’t see why I couldn’t do this. In a sense, I’m more daunted by the challenge of writing this well than I am about doing the actual trips. Journeys – and books about them – are always more fun with the right company, so perhaps this is where someone else who’s up for joining the challenge could make a real difference. And because of the bite size nature of this series of routes, there’s no reason for me not to at least make a start on the list. Whether I then turn this into a book rather than just a series of lighter blog posts, however, is a big question. What do you think? Is this a book you’d like to read? Let me know in the comments below. 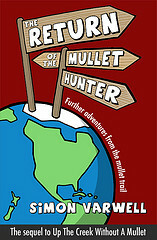 And read the rest of my series of Books on the Horizon here.